On The Level, located at 906 Ocean Blvd, Topsail Beach has been providing outstanding service since 1986. Their service includes: Home Preparedness, Preventive Home Care, Design Options, Handyman Services, Interior Services, and Exterior Services. You can check out their site and their examples here, which are extremely well done and incredibly creative. Seriously, these people have created some really cool designs for their clients. 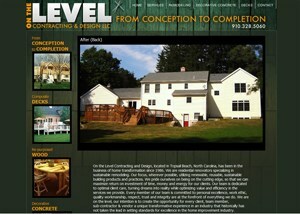 If you're in the coastal Carolina's, check out On The Level.